How Can I Get My iPhone Data in DFU Mode? At times we need put iPhone into the DFU mode for easy jail breaking, recovering from an earlier jail breaking, unlocking a SIM, etc, or your iPhone goes into the DFU mode involuntarily such as software updates, etc., which leads to the loss of your iPhone data without backup, what would you do in such circumstances? Do you really understanding the meaning of DFU mode? Do you know how to exit the mode of DFU and how to recover data when your iPhone is stuck in DFU mode? In this article, we're going to help you resolve all these problems. Just keep on reading now. Part 2. How to Exit DFU Mode? Part 3. How to Recover iPhone Data in DFU Mode? DFU, short for Device Firmware Update, is a state on your iOS device which can help your device connect with iTunes without loading the OS or booting loader, which can be used to fix some major issues of your device. It is one of the most complicated types of iDevice restores, and the other two are: iTunes restoration and recovery mode restoration. Sometimes we may put iPhone into DFU mode in order to fix some issues such as jailbroken iPhone, etc., sometimes iPhone may be stuck in the DFU mode by itself, no matter how your iOS device goes into DFU mode, it is really important for us to know how to exit DFU mode on your iPhone, and here are two easiest methods to help your phone get out of DUF mode. For different models of iPhones, the reboot method is different. Follow the simple instructions below to simply force restart your iPhone. For iPhone 6s and former, just hold the Home button and Lock button until the device reboots. For iPhone 7/7 Plus, hold down the Volume Down button and Side button until the device reboots. For iPhone 8/8 Plus/X and later, quickly press the Volume Up button, then quickly press the Volume Down button, and then hold down Side button until the device reboots. The other method to get out of DFU mode is to use iTunes app to restore your iPhone to factory settings. Remember to back up your iPhone data to avoid further data loss before you use this solution. Step 3. Click on the "OK" button to close the window and then hit the "Restore iPhone" option. 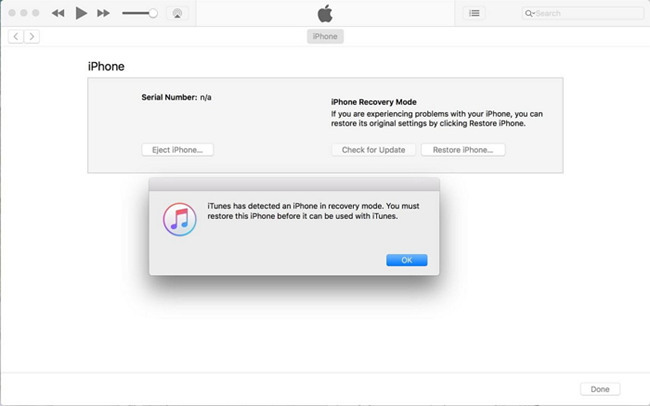 Now iTunes is restoring your device. Wait a while until the progress bar ends. Now your iPhone is totally getting out of DFU mode, you can check whether your data has been lost. If your data is lost unluckily, you can simply use your iTunes or iCloud backup to restore them. The other effective method is to use a professional and smart iOS data recovery utility such as Joyoshare iPhone Data Recovery to get them back. This trusty iPhone data recovery software is competent of recovering deleted iPhone contacts, messages, photos, videos, notes, calendars, WhatsApp/Viber/Kik messages and attachments, etc. and many more from iTunes/iCloud backup or without backup. Besides the data lost due to device stuck, it can also salvage lost iPhone data from all possible data loss scenarios like system crash, virus attack, forgotten passcode, iOS upgrade, water damage, and so forth. Before recovery, you're also allowed to preview the items and recover any one you really want. 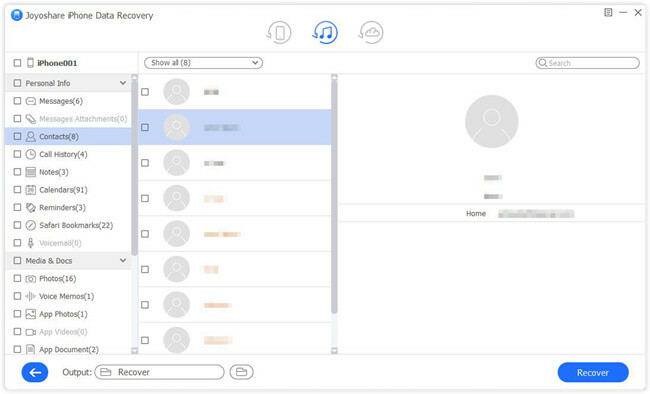 First of all, go to the download page of Joyoshare and choose iPhone Data Recovery to download and install it on the computer. After that, open Joyoshare on the desktop and select "Recover from iTunes" mode from the top menu bar. Now you can see all the iTunes backup files you have, or add a new one by clicking the "+" button. Then select one that may contain your lost data and click the Gear icon to choose the data types you'd like to recover. Next click the "Scan" button to allow Joyoshare to analyze and find your data from iTunes backup. When the scanning process is completed, you'll find all recoverable files displayed orderly in categories. Preview them and tick the ones you want, and then press the "Recover" button on the lower right corner to save them to your computer. Launch Joyoshare iPhone Data Recovery and switch to the "Recover from iCloud" mode. Enter your Apple ID and password to sign in iCloud account. See also: Forget iCloud Password? Here are 4 Solutions! After log into iCloud account successfully, all your iCloud backup files will be detected here. Choose the most relevant one and click the Download icon to download all the data from this backup. Then click the "Scan" button to start to extract lost files. Wait a while until the scanning is done. You can now preview all recoverable files in the same way, or filter out the deleted files by choosing the "Only show the deleted" option from dropdown menu. Then press the "Recover" button and you'll get all lost data back in a few seconds.